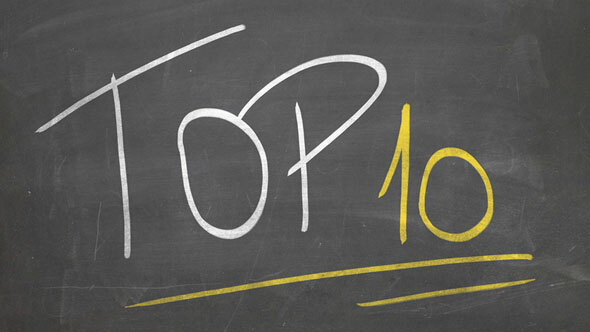 1.U.S. Markets Trading at a Premium vs. Developed International for a Reason. 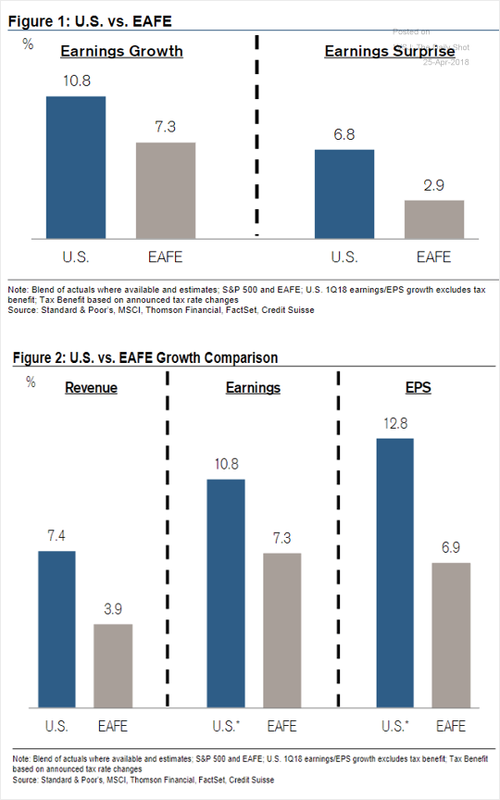 Equity Markets: US Q1 corporate earnings growth has outperformed that of other developed economies (EAFE). 2.Can Earnings Season Clear Wall Street’s High Hurdle? Editor’s Note: Below is a brief excerpt from this week’s edition of Market Edges. Click here to learn more about Market Edges. 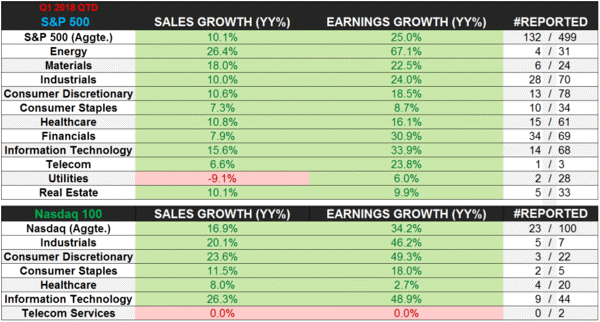 So far, 132 S&P 500 companies have reported year-over-year 1Q 2018 Sales and Earnings Growth of 10.1% and 25.0% respectively. It’s early and we’ve been warning Market Edges subscribers about Wall Street’s sky-high earnings expectations for the coming quarters and increasingly difficult comps. Essentially, Wall Street’s earnings estimates for the first quarter of 2018 are currently sitting at levels not seen in 7 years (16.5%). So far so good for hitting that first quarter number, but there’s still a lot of time left. Furthermore, estimates into the second, third and fourth quarter are equally high (19.7%, 20.9% and 18.0% respectively). That’s a pretty high bar. Why? With tough comps and wage growth likely picking up in 2018, we think profit margins get squeezed from here. In other words, the peak in earnings growth is probably in. 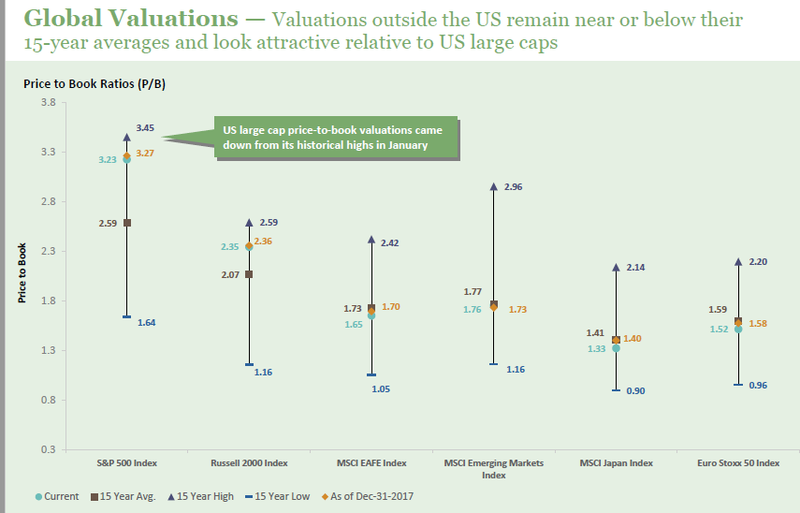 3.Global Valuations Discounted Vs. U.S.
4.Commodities 20 Year Discount to U.S. Equities. Commodities are the top returning asset class of 2018 so far, according to data put together by Bank of America Merill Lynch. The sector’s return rate is 22.7% year-to-date. 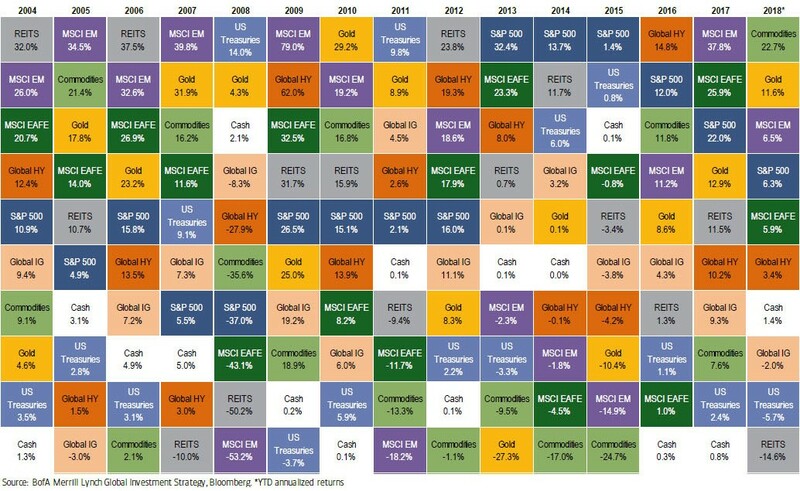 If commodities keep up this pace for the rest of 2018, it will be the best year for the asset class since 2003. Is the commodity supercycle coming back from the dead? For now, such a claim could perhaps be considered both bold and premature – but there does seem to be some compelling evidence that is mounting to back it up. As Frank Holmes of U.S. Global Investors described in a recent post, the last boom was so prolific that investing in an index tracking commodities (such as the S&P GSCI) in 2000 would have resulted in the equivalent of 10% annual returns for ten years. 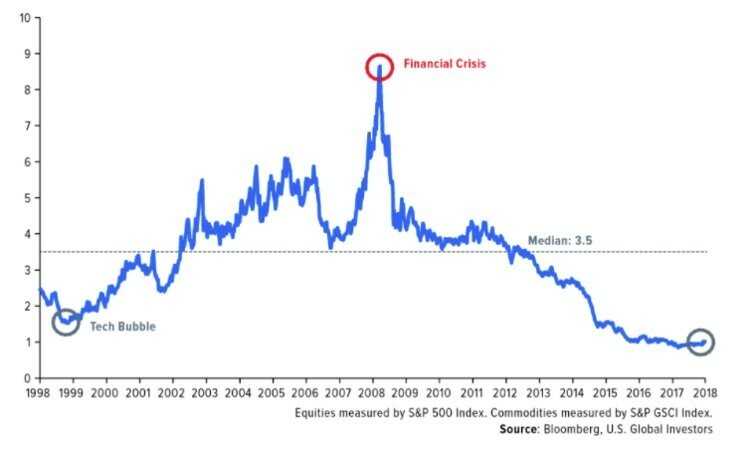 In other words, commodities seem to be more undervalued than any time in the past 20 years, at least relative to equity indices such as the S&P 500. Even if the above ratio comes back up to the median of 3.5, it’s clear that there could still be vast amounts of opportunity available in the sector for investors. Copyright 2018. Follow Visual Capitalist on Twitter. 5.Sector Leadership Takes a Temporary Move Sideways. 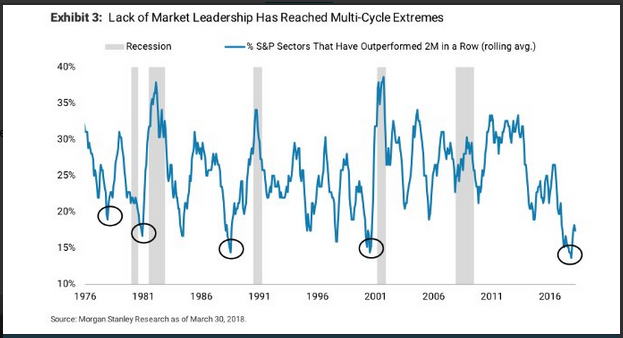 MS noting a amazing lack of market leadership – % of S&P sectors outperforming 2 consecutive months – is at multi-cycle lows. 6.One Reason for Sideways Sector Leadership-Tech Stocks on Earnings Show Me List. 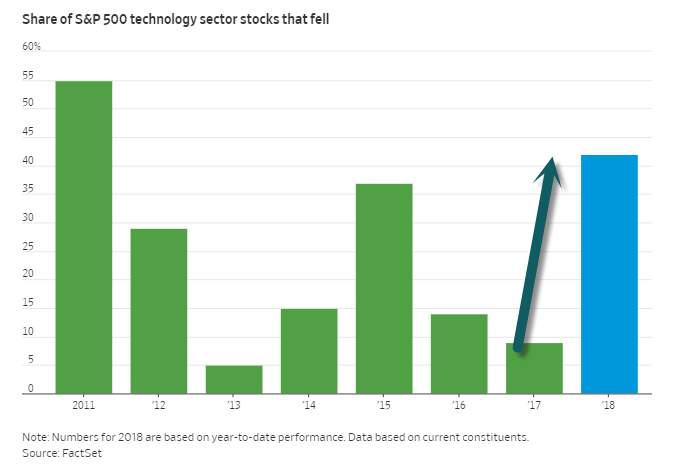 Investors rattled by recent volatility are becoming choosier about which technology-focused stocks they scoop up, a reversal from 2017 that threatens to undermine the tech sector’s dominance in the long stock rally. The S&P 500 tech sector, up 1.8% in 2018, is still among the best-performing groups in the broader index. But more than a third of the 69 stocks in the sector have declined in 2018, the most for any full year since 2011. In 2017, only six of them had lost ground. The divisions are likely to come into sharper focus as more tech-focused companies report financial results in the coming days. With valuations already stretched by traditional measures, investors are contemplating which companies warrant the higher multiples that typically come with the tech label. After all, advanced technology underpins nearly every business, from banking to manufacturing, investors say. One of the problems with the market we have been highlighting over the last several weeks has been the equity market’s inability to hang on to early gains. Whether or not stocks trade higher at the open, the trend throughout the trading day has been lower. In the Treasury market, we have seen a similar trend as investors take any opportunity they can get to dump long-term paper. 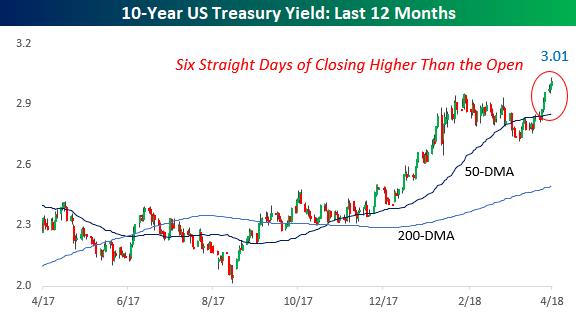 Since the direction of treasury prices has the opposite impact on yields, this has resulted in some strong upward momentum for treasury yields. Take the last week or so, for example. If today’s increase in yields holds, the yield on the 10-year US Treasury will have finished the day higher than it opened for six straight days. This helped to push the yield above the ‘dreaded’ 3% threshold. Similar runs of strong intraday increases in the 10-year yield have been relatively uncommon over the last twenty years with the current streak being the 19th such streak of six or more days. The longest streak of consecutive open to close increases in the 10-year yield lasted nine trading days in the period ending in June 2006, and the most recent streak of six or more days was exactly two years ago today! Stocks are too worried about 3% today. The earnings season is going really well and at the macro level corporate America has plenty of cash and hence little borrowing needs, so companies are not impacted much by higher long rates. And the main impact of higher interest rates on US households is via demand for housing. 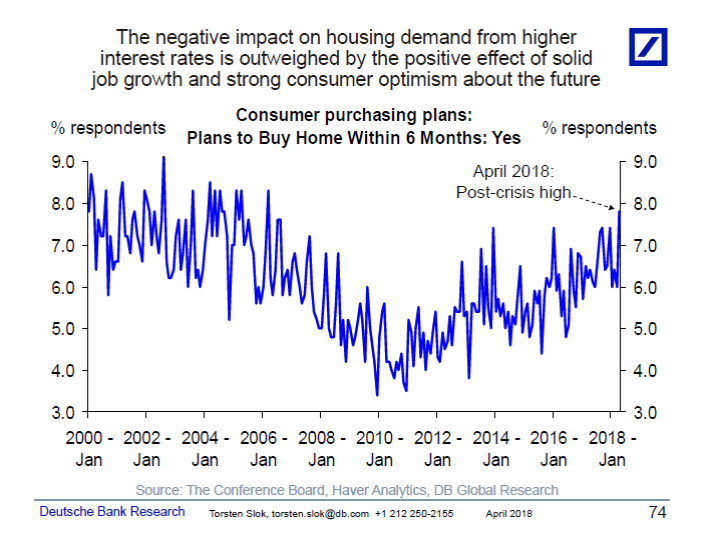 But data that came out earlier today shows a cyclical high in the number of households looking to buy a home in the next six months, see chart below. This is driven by solid job growth and continued strong optimism among consumers about the future. The bottom line remains that the risks of overheating and inflation continue to be bigger than the risks of a recession. For more see also here. Let us know if you would like to add a colleague to this distribution list. New research suggests checking account customers are doing something that indicates they don’t feel very secure about the economy. How much money is in your checking account? Here’s why it matters — and what it might say about you. Markets are experiencing another period of volatility this week, and new research suggests checking account customers are doing something that indicates they don’t feel as secure as they would like about the economy. They’re not feeling as safe as some economists would have expected. Moebs Services, an economic-research firm in Lake Bluff, Ill., analyzed over 12,000 depository call reports and compared them to the Federal Reserve monetary data for 2017. 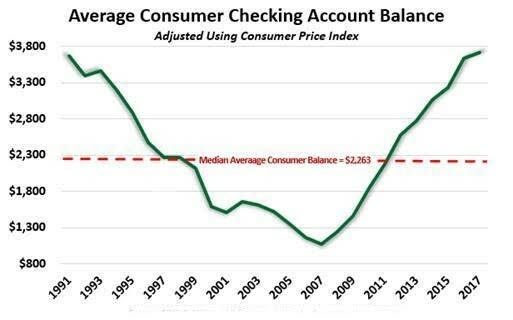 The average consumer checking balance has increased in 23 of the past 30 quarters. When times are good, Americans feel confident by keeping little in checking, but when times are difficult consumers store money in checking accounts, effectively pulling back on spending on retail and restaurants. “Yet, the Federal Reserve keeps raising interest rates,” he said. If you’re coming home complaining to your spouse about your miserable work, it may be for these unfortunate reasons. Ever feel like you’re walking on egg shells at work? Your opinions don’t matter, you’re afraid of making mistakes, and the culture is one of fear and intimidation. Most likely, if you’re coming home complaining to your spouse about work almost daily, and you’re beginning to feel physical symptoms of stress (perhaps unbeknownst to you because you think, “no big deal”), it may be time to admit that your work is a terrible, toxic, place to be. Not sure? Here are six sure ways of knowing if your workplace is undeniably toxic. Your manager is a control freak. This person micromanages to the last detail. The situation is overbearing and stifling, because he or she wants control over decisions. He or she distrusts the team and doesn’t delegate; there’s no room for group discussion or input because the leadership style is autocratic. In turn, creativity or learning something new is absent under this dictatorship. The motto is: Just take your marching orders and report back. People play the blame game. You’ve probably heard the saying, “For every finger you point, there’s three pointing back at you.” At such a company, you’ll find colleagues lacking in personal accountability — often a character issue — and throwing blame grenades at each other. If this is your company and you’re caught in the middle of a minefield, your best option (short of quitting) for conflict management is to rise above it: Point out the specific behavior in question, don’t personalize the issue (be objective), communicate assertively and state the facts, and document everything that goes on. You can’t trust anybody as far as you can throw them. In a volatile and politically charged culture of distrust where people form alliances and managers pit employees against one another, it’s not safe to disclose information or work in close collaboration. Job survival in this tense competitive environment is day to day, owing to the unpredictability of the place. Trusting your peers is risky–they may really be your enemies. Trusting your manager is just corporate suicide. Consider updating your résumé because, if you have any integrity left, you may be on your own. You know who they are–most likely disgruntled workers who didn’t get something their way, disagreed with a change of direction and are now holding grudges, or didn’t get that promotion they felt entitled to. They are quick to gossip, and even quicker to hammer leadership for “dumb decisions.” Keep a close eye on them. They spread their tumor by enlisting others into their negative spin campaign. They’ll also be sure to befriend those innocent new hires to vilify someone or something. Watch for two-faced brown nosers. Ever seen colleagues who kiss up to management to win favors, usually at your expense? You know them well — they’ll go out of their way to befriend and manipulate management in order to negotiate preferential treatment. Things like undue pay raises, training, extra time off, or special perks that nobody else knows about or gets. Keep an eye out for colleagues that spend way more face time with their managers than usual. The wheels of manipulation and favoritism may be in motion. People are treated like numbers. From a senior management perspective, employees are viewed as worker bees and considered to be objects or expenses rather than assets; there is little concern for their happiness or well-being. After all, the motive for hiring them was purely for productivity and profit. There’s little evidence of leaders’ compassion and empathy in seeing employees as valued human beings. As a result, you’ll encounter high levels of stress, turnover, absenteeism, and burnout.